William Hurd Scheide, the Princeton philanthropist, bibliophile, and musicologist who died at age 100 last November, has left his collection of some 2,500 rare books and manuscripts to his alma mater, Princeton University. The bequest, announced Monday and valued at nearly $300 million, represents the largest donation in the University’s history. A fire has destroyed parts of one of Russia's largest public libraries, containing more than 14 million items. James D. Watson’s sold for $4.76 million while the one owned by William Randal Cremer, a member of Parliament and labor activist, fetched just $17,000. Is The Bull Market Back At Baseball Card And Autograph Shows? 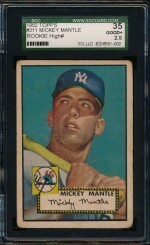 If you’ve read my other posts, you can tell that I really enjoy attending a good baseball card show to swap stories with other baseball history fans and revel in vintage tobacco and gum cards, But for the past year I have worried that these events are going the way of Sunday double-headers that were routine in the 1950s and 1960s.